Aspire Dental Bridge Dentistry - Aspire Dental, Your Austin Dentist! A bridge, also known as a fixed partial denture, is a dental restoration used to replace a missing tooth by joining permanently to adjacent teeth or dental implants.Types of bridges may vary, depending upon how they are fabricated and the way they anchor to the adjacent teeth. Conventionally, bridges are made using the indirect method of restoration. However, bridges can be fabricated directly in the mouth using such materials as composite resin.A bridge is fabricated by reducing the teeth on either side of the missing tooth or teeth by a preparation pattern determined by the location of the teeth and by the material from which the bridge is fabricated. In other words, the abutment teeth are reduced in size to accommodate the material to be used to restore the size and shape of the original teeth in a correct alignment and contact with the opposing teeth. The dimensions of the bridge are defined by Ante’s Law: “The root surface area of the abutment teeth has to equal or surpass that of the teeth being replaced with pontics”.The materials used for the bridges include gold,porcelain fused to metal, or in the correct situation porcelain alone. The amount and type of reduction done to the abutment teeth varies slightly with the different materials used. The recipient of such a bridge must be careful to clean well under this prosthesis.When restoring an edentulous space with a fixed partial denture that will crown the teeth adjacent to the space and bridge the gap with a pontic, or “dummy tooth”, the restoration is referred to as abridge. Besides all of the preceding information that concerns single-unit crowns, bridges possess a few additional considerations when it comes to case selection and treatment planning, tooth preparation and restoration fabrication. 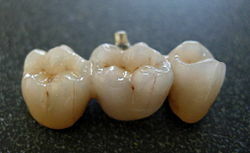 A three unit porcelain fused to metal bridge (PFM) made by a Dental technician. A semi-precision attachmentbetween teeth #3 and #4, with the female on #4. Note the lingualbuttons extending, in the photo, upward on #2 (on the left) and downward on #4. These are used to grasp the crowns with a hemostat and make them easier to handle. They can also be used to aid in removal of the crown in case there is an excessive amount of retention during the try-in. They are cut off prior to final cementation.